Dubbed the "Pearl of the Adriatic," beautiful Dubrovnik offers a wealth of attractions for visitors. Famous for its spectacular seafront location on the Dalmatian coast coupled with its evocative and historic old city center, Dubrovnik was founded in the 7th century and has been ruled through the centuries by the Venetians and the Hungarians, each of which have left their mark. The city enjoyed its greatest growth in the 15th and 16th centuries, a fact reflected in the impressive architecture and its designation as a UNESCO World Heritage Site. Home to Croatia's artistic and intellectual elite, Dubrovnik offers numerous cultural activities and festivals. Highlights of a visit include walking around its picturesque old streets and alleys while visiting such excellent attractions as its splendid cathedral and treasury, the broad Stradun pedestrian walkway, and its many fine old palaces and fortifications. 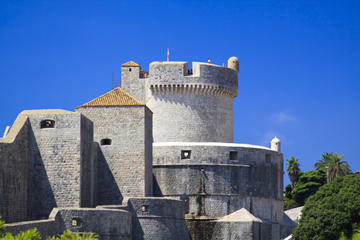 The old city walls of Dubrovnik are one its best-known features. Built in the 10th century and modified in the 13th and 14th centuries, these formidable walls - as high as six meters and up to six meters thick-provided a solid defense against invaders. Totaling nearly two kilometers in length, Dubrovnik's city walls make a great spot for a casual stroll and offer numerous excellent views over the Adriatic and inwards over the old city center. Other highlights include its two towers, the Minceta Tower and the Bokar Tower, along with two forts, the Lovrjenac Fort and the Revelin Fort. Access to the walls is through the main entrance on the left of Pile Gate (admission is charged). The spectacular Stradun is a place where locals and visitors alike gather day and night to watch the world drift by. Undoubtedly one of Europe's most picturesque pedestrian thoroughfares, the Stradun boasts many cafés and restaurants and is a good spot to rest weary feet after a day touring Dubrovnik. Measuring 300 meters in length and famous for its white limestone paving, the street dates back to 1468, although many of the surrounding buildings were built in the 17th century after the devastating earthquake of 1667, when most of Dubrovnik was heavily damaged. The Stradun's unique homes are designed to enable residential living upstairs and business activities on the main level, and are notable for having their main doors and windows under the same arch. Standing on the site of an older cathedral dating from the 6th century and destroyed by earthquakes, beautiful Dubrovnik Cathedral-also referred to as the Assumption Cathedral (its full name is the Cathedral of the Assumption of the Virgin Mary)-was designed in Baroque style by Andrea Buffalini of Rome. Notable for its three aisles, three apses, and splendid interior décor, the cathedral includes highlights such as paintings by Italian and Dalmatian artists from the 16th to 18th centuries, including Virgin of the Chair by Raphael from the early 1600s. A must see is the cathedral treasury with its many important relics, the most famous being a portion of the cross that Jesus is thought to have been crucified upon. Other famous relics include the head, leg, and arm of St. Blaise, dating from the 13th century, as well as a splendid display of 138 gold and silver reliquaries from around the world. For centuries, Dubrovnik's famous Pile Gate has served as the main entrance and is still the most interesting access point to this fabulous old city. Formerly surrounded by a moat complete with a drawbridge built in 1537, the pedestrian-only Pile Gate - one of two entrances to the Lapad area - also boasts a pleasant garden in the old moat. Other highlights include a statue of St. Blaise located in a niche in the arch and carved by famous Croatian artist Ivan Meštrović, and, within the ramparts, a door dating back to 1460. Another gate worth seeing is the 14th-century Ploce Gate, just behind the Asimov Tower and designed as a "double defense" system that proved effective in times of trouble. Also imposing and located just across the moat from the Ploce Gate is the Revelin Fort, designed by Tvrđava Revelin in 1580. The Square of the Loggia in Dubrovnik has long been a central gathering point for citizens and visitors alike. Featuring some of Dubrovnik's most famous buildings and public monuments, the square of the Loggia is in the north east section of the old city center. Highlights include Orlando's Column, built and designed by sculptor Antonio Ragusino, as well as the famous Loggia of the Bells dating from 1480 and used as an early warning system by residents in times of unrest. It's here you'll find the Church of St. Blaise, of interest for its Baroque façade and its collection of priceless works of art. Also of interest on the square are a clock tower from the 15th century, the main guardhouse, and the small fountain of Onofrio. Dubbed "Dubrovnik's Gibraltar" for its location on a rocky promontory just outside the city's western wall, Fort Lovrijenac has long been one of Croatia's most important fortresses. Rising an impressive 37 meters above the Adriatic, this stunning fortress proved impregnable during the many sieges undertaken by the Venetians from its completion in the 11th century onwards (legend has it the Venetians themselves planned to build a fort here but were beaten to it by industrious city folk). Also notable for its unusual triangular layout with its three terraces, Fort Lovrijenac - also known as Fort Lawrence - is accessed via two drawbridges and a gateway through its impressive walls, as thick as 12 meters in places. In addition to serving as a tourist attraction, the fort is also used as a venue and backdrop for Dubrovnik's famous Summer Festival and its many theatrical and musical performances. Built between 1438 and 1444, Dubrovnik's famous Big Fountain of Onofrio is probably the best known of the city's many historic monuments. An easy stroll from the Pile Gate, this landmark structure is somewhat smaller today than the original due to damage caused by the earthquake of 1667. An important part of the city's original water supply system (also designed by Onofrio de la Cava) that carried water from the Dubrovacka river, the fountain stands immediately in front of the equally attractive St. Saviour Church (Crkva sv Spasa), built in the early 16th century in thanks for what city elders believed was divine intervention in sparing the city during an earthquake a few years earlier. One of only a few buildings to survive the devastating earthquake of 1667 intact, this small place of worship is well worth visiting for its fine Gothic and Renaissance features. Built in the early 1300s, Dubrovnik's Dominican Monastery was so large that construction required moving parts of the city walls just to accommodate it. Heavily damaged in the 1667 earthquake, the monastery was completely rebuilt in its present form with special attention given to preserving features such as its splendid late Gothic cloister (the original was designed by Michelozzo di Bartolomeo of Florence in the 15th century). A particular highlight is visiting the monastery's museum with its many 15th- and 16th-century religious paintings in the style of the Dubrovnik (also known as the Venetian) School, along with interesting items of gold and silver and other relics. Be sure to also visit the city's Franciscan Monastery, home to one of the most valuable libraries in Croatia and a fascinating medieval pharmacy with its old decorated jars, measuring devices, and mortars (the pharmacy has been in use since 1317). There's also an on-site museum containing items of historical interest and a fine art collection. Designed by Onofrio de la Cava in 1435, the Rector's Palace, now home to the city's Cultural Historical Museum, has been much altered through the centuries. A beautiful mix of late Gothic and early Renaissance styles, this splendid old palace was heavily damaged by a gunpowder explosion not long after its completion, later by a fire, and then again in 1667 when an earthquake struck. These days, this well-preserved building is a delight to explore, particularly its pleasant central courtyard (try to time your visit to coincide with one of its regular summer classical music performances). Also of interest is the bust of Miho Pracat, a former merchant from the island of Lopud. Highlights of the museum's collection of 15,000 pieces include many interesting exhibits detailing life in the Republic of Ragusa during medieval times, as well as numerous fine paintings by Venetian and Dalmatian artists. On the eastern edge of the old town is the Fort of St. John, known to locals as the Fort of St. Ivan. Once an important part of Dubrovnik's defenses, this imposing structure now houses several modern attractions to keep visitors entertained. In the upper area is the Maritime Museum of Dubrovnik featuring displays of Dubrovnik's maritime past illustrated through model boats and naval artifacts, while the lower area contains the Aquarium of Dubrovnik with its many interesting displays of local and exotic fish, as well as a superb collection of seahorses. Also worth a visit is nearby Bokar Fort, designed and built by Michelozzo di Bartolomeo Michelozzi and a great spot to visit for its excellent views over the city and the Adriatic. Luxury Hotels: With breathtaking views of the coast and Old Town, the clifftop boutique Villa Dubrovnik whisks guests to the heart of the historic action within minutes in a private speedboat. Above a delightful seafront promenade on the Lapad peninsula, about five kilometers from the Old Town, the Royal Princess Hotel offers a pool and beach access as well as gorgeous sea views. Also with a pool and easy beach access and within walking distance of the Old Town, the waterfront Hotel Bellevue Dubrovnik has a contemporary feel and beautiful sea views from its floor-to-ceiling windows. Steps from the Old Town, the pet-friendly Hilton Imperial Dubrovnik offers great value in a convenient location. Mid-Range Hotels: In Gruz harbor, a short bus ride from the Old Town, the boutique Berkeley Hotel, with a pool and free breakfast, offers modern rooms and apartments. You can walk to the Old Town in about 20 minutes from pet-friendly Hotel Lero, but a bus is also nearby. The hotel comes with a pool and free breakfast. In a lovely park-like setting, Hotel Zagreb occupies a historic residence a walk from the beach and a short bus ride away from the Old Town. Budget Hotels: A stone's throw from the sea and a ten-minute bus ride from the Old Town, Hotel Perla features clean, simple rooms and includes breakfast. Also a short bus ride from the Old Town, Hotel Petka offers basic rooms, some with sea views, while the quaint Stella Apartments, with kitchenettes, are in a great location about five minutes' walk from the Old Town. See the City Sights: Enjoy two different perspectives of the city on the Dubrovnik Super Saver: Mt Srd Cable Car Ride plus Old Town and City Walls Walking Tour. Glide up the rocky slopes of Mt Srđ in a cable car for a bird's-eye view over the city then explore the atmospheric streets of the Old Town on a walking tour. This great-value 4.5-hour excursion blends two popular sightseeing trips and includes an expert guide, round-trip cable car ride, and entrance fee to the city walls. Game of Thrones Tour: If you're a Game of Thrones fan, the Viator Exclusive: 'Game of Thrones' Walking Tour of Dubrovnik is a fun way to see some of Dubrovnik's top historical attractions that also appear in the famous television series. The three-hour guided walking tour includes a knowledgeable guide and entrance fees to the Dubrovnik city walls and Lovrijenac Fortress. You can upgrade the tour to include a 1.5-hour visit to to Trsteno Arboretum, site of the King's Landing's palace gardens. This upgraded tour also includes round-trip transport from the Old Town to Trsteno Arboretum and the entrance fee. Paddle along the Old Town: For a different perspective of the city and a more intimate tour, consider the Dubrovnik Sea Kayak and Snorkeling Small-Group Tour. Accompanied by an experienced guide, you paddle along the old city walls in a kayak, then head to Betina, a cave beach, where you can enjoy a snack and refreshment and snorkel in the cool, clear water. This fun, half-day excursion includes kayak and snorkel equipment; a safety briefing and instruction; bottled water; snacks; and hotel pickup and drop-off, if you select this option. Take a Day Trip: From Dubrovnik, it's easy to hop across borders on a day trip and add some of the fascinating neighboring countries to your itinerary, without the hassle of planning all the details. 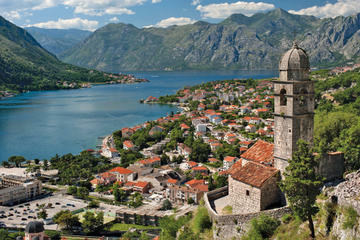 On the Montenegro Full-Day Trip from Dubrovnik, an experienced guide picks you up directly from your hotel in a comfortable, air-conditioned minivan and drives you along the dramatic Dalmatian Coast to this tiny but ravishingly beautiful country. The tour includes a ferry ride and entrance to World Heritage-listed Kotor, where you can explore the walled, medieval town of Budva and visit the luxury island hotel of Sveti Stefan. A boat trip to Our Lady of the Rocks island is optional. Also with hotel pickup and drop-off, the Bosnia and Herzegovina Day Trip Including Medjugorje and Mostar takes you across the border to visit this beautiful country, including Mostar and the sacred site of Međugorje, a popular Catholic pilgrimage town. Explore Neum by the sea and UNESCO-listed Počitelj and learn all about the rich history of the region from your experienced guide on this full-day tour, which also includes entrance fees.